It might appear that I have too much time on my hands. Not so. Actually, it has more to do with insomnia. I lay awake thinking… thinking… thinking…. and every now and then there is an idea that won’t let go. Here are my ideas for Cat Maudy’s mast re-design. Problem: How to modify the design of the top of our mast, so that Cat Maudy can easily navigate under 65′ bridges on the ICW without having to hoist one of the captains 63 feet above the water to remove “gear” that adds 2 or more feet to our “Air Draft”….and then return back UP to the top…when sailing in open water. Too much captain hoisting!! 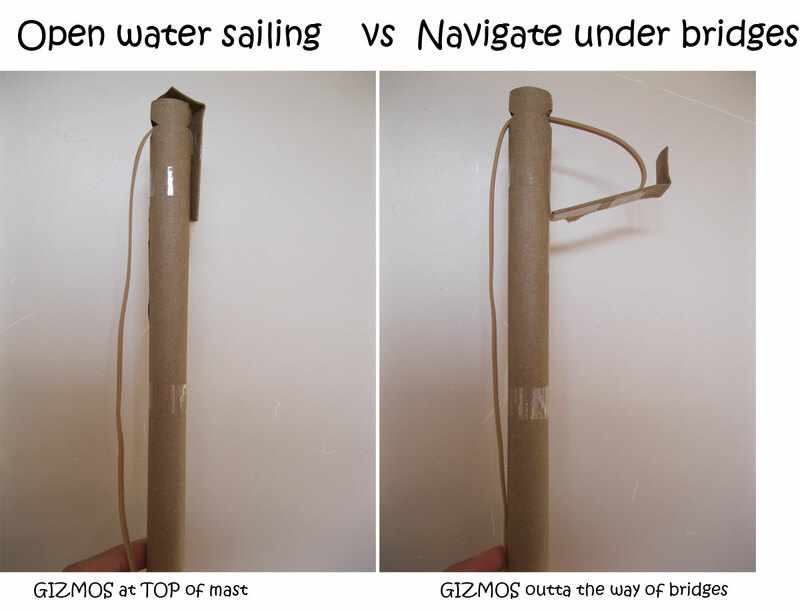 Solution: The adjustable HINGED-HOLLOW-SPREADER with controls at the base of the mast to allow either (a) open water sailing with gear resting ATOP the mast or (b) bridge navigation with gear resting at some acceptable angle below the mast.